You! You worthless piece of slime! You ignorant disgusting blob! You’re nothing but an unstable short-chained molecule! You foul obnoxious muck! You have a weak electrochemical bond! I have seen some disgusting crud in my time, but you take the cake! If you’re my age, you instantly recognize this dialogue between Ray and Egon as they taunt a green slime specimen in Ghostbusters. Oddly enough it sounds a lot like many of the conversations I’ve recently overheard regarding Lean Finely Textured Beef (LFTB). 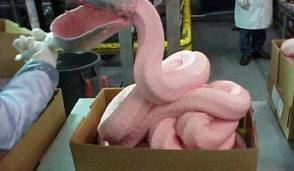 Disaffectionately called “pink slime”, this “edible beef product” derived from beef-fat trimmings and washed with ammonia has set off a firestorm of controversy and concern over its potential inclusion in USDA commodities, and therefore, school lunch programs. While everyone from the First Lady to the NFL has a program to fight childhood obesity, the USDA is quietly putting a higher price tag on the healthy products we need to feed our kids and selling us “pink slime” on the cheap. It’s a nutritional Iran-Contra affair that nobody seems to care about. Well…except maybe Gail Wilkerson and a small army of school food service directors around the country. So far, we’ve made the conscious choice to pay more for higher quality products and to keep our lunch and breakfast prices exceptionally low. Unfortunately, I’m not sure how long we can continue to do so. While our district had access to excess recapture money, we used large sums of that money to subsidize the school lunch program. And when I say subsidize, I’m talking about hundreds of thousands of dollars. Now that the recapture money is gone, our food service program and our Board of Trustees are going to face a difficult decision. We have a fiscal responsibility to close the deficit that currently exists in that fund as well as maintaining our commitment to healthy meals. That’s not going to be easy. A new federal law requires school districts to start bringing their meal prices in line with what it costs to prepare the meals. Eventually schools must begin charging an average of $2.46 for the lunches they serve. The mandatory increases in meal prices are “a recognition that over time, the money coming in to schools from the sale of paid meals has not kept pace with the cost of preparing those meals” according to the USDA. While that seems like it would certainly help revenues, those of us who have worked with school lunch program budgets know that these price increases will also bring about lower participation rates. And that just doesn’t translate to huge revenue gains. So what’s the answer? Like most problems, the solution probably lies somewhere in the middle. We know we have to raise prices. We know we’re going to have to cut costs somewhere down the line. And yes, we’re probably going to have to take a hard look at what we are serving and how much it costs us. But as my Grandpa used to say, “That’s no hill for a climber.” We’ll find a solution. We’ll roll up our sleeves and sharpen our pencils. We’ll get creative and above all else, we’ll make sure some of our thinking occurs outside of the proverbial lunch box. And if he’s available, we’ll bring in my lunch box hero, the Six Million Dollar Man. Now there’s a guy who could solve a problem. I was a fellow teacher when Gail was teaching Home Ec at PHS. We are very lucky to have her in charge of our lunch program. Very good post, Jay. Keep serving high quality meals to our kids – I’ll pay more to keep it healthy. Thanks Gail and Jay. Thanks Deanne. I think most people feel the same way.